Not everyone will leave the rented area with endless destruction in their wake, but it’s entirely possible, and you need to be able to assess how much of the security deposit you’ll need to fix it. At Atlantic Maintenance Group, we provide services that will help repair your home after a tenant has left. Tenants can be complicated people; they will want their entire security deposit back even if the damage requires most or all of the funds. Not everyone will leave the rented area with endless destruction in their wake, but it’s entirely possible, and you need to be able to assess how much of the security deposit you’ll need to fix it. Here’s how you can assess the damage. How much are you charging for rent? Are you providing utilities? These are very important questions to ask when it comes to determining a security deposit. The most you’ll be able to charge for a security deposit is two months rent, but that’ll probably turn away a lot of potential renters. There are also state limits that come in when security deposits are being calculated. As long as you’re following the rules, charging a high security deposit is possible if you feel as though you are renting to a problem client. 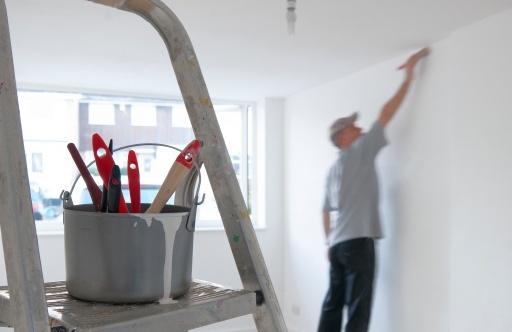 What you provide with the rented area can be easily damaged by tenants. Furniture is a good thing to consider when charging a security deposit. You should also separate the pet deposit, as pet damage can be seen as a constant damage factor. Make that deposit nonrefundable to protect your assets. You could also charge a small monthly rent fee if a tenant has a pet. Carpet stains? Damaged walls? Excessive damage should be legally considered. A tenant should be reporting damage to you as it happens, and any kind of damage that would exceed a security deposit can be cause for legal action. Your rights as a landlord are protected, and as long as the tenant signs the agreement, they are held legally responsible for heavy damage. Do you need a rental property renovated? Atlantic Maintenance Group can help! If your rental property needs some work after a tenant has left, Atlantic Maintenance Group is ready to help you with our variety of landscaping, asphalt, snow removal, and concrete maintenance services. We are experts in our field and we are prepared to meet your needs with a price and product that will leave you grinning. If you’re interested in getting a free quote or more information, visit us online or give us a call at (410) 768-4720. To see examples of our work and stay up to date on our specials, follow us on Facebook, Twitter, Pinterest, and Google+. This entry was posted on Friday, August 26th, 2016	at 5:20 pm	and is filed under Blog, Home Repair	. You can follow any responses to this entry through the RSS 2.0	feed. Both comments and pings are currently closed.